Momma took a half day this morning! Which is kinda funny cuz she might have to work OT again tonight to get her work done. Momma's are funny like that. Any way, I did my best to keep her lap warm cuz it was only a pink day so far. Well, really, it was a white day if we were using the windchill. Luckily, now that she's off to work it's a violet day and I have Casa Grande to myself! Awww, Z, you are truly a sweet boy! He certainly is a laid back ball of fur! Mine is front of the gas fireplace and he is not going anywhere soon. 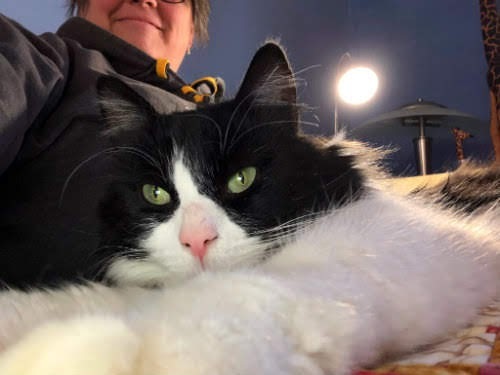 Z you are a good son to help keep Mama's lap work during these cold winter days. With your supervision, the portrait will be purrfect!